Culture Club is in the midst of the band's biggest-ever tour. Michael Jackson was the big story at the 1984 Grammys, thanks to his Thriller album and its cavalcade of hits. But those awards also marked the first time the influence of MTV and the dawning of music video were felt — particularly when the winner of the Best New Artist trophy beamed in via satellite. "Thank you, America!" Boy George said with a mischievous smile after Culture Club won the prize. "You've got style. You've got taste. And you know a good drag queen when you see one." By the time Culture Club was accepting the prize, the band led by the flamboyant frontman already had two hugely successful albums — 1982's Kissing to Be Clever and 1983's Colour by Numbers — that sold tens of millions of copies around the globe on the strength of George's soulful croon and a reggae-fied synth-pop sound from drummer Jon Moss, guitarist Roy Hay and bassist Mikey Craig, as well as videos that played up the band's visual appeal. Looking back now, as the band is in the midst of its longest-ever tour, Craig still considers the fact that Culture Club broke through in America to be "a miracle." Someone at the record label had the idea of putting out the band's first single "Do You Really Want to Hurt Me?" without any photos of the band on the record sleeve, he says, "because of the fear of how we looked and how we might be perceived." "America, especially in those days, was quite a conservative place," Craig says. "It was genius in the end, because the record broke on its own merit. And then the whole situation was compounded by America getting a look at us, seeing this kind of strange collection of people." It's safe to say that for much of Middle America, Boy George was one of the first introductions to androgyny, thanks to MTV sending videos for songs like "Karma Chameleon," "I'll Tumble 4 Ya" and "Miss Me Blind" into living rooms right alongside those by Madonna and Bruce Springsteen. "After the airplay of 'Do You Really Want To Hurt Me?' it was basically MTV that broke the band, really," Craig says. I remember fighting with my sister over whether Boy George was a man or woman after seeing Culture Club on weekly countdown show Solid Gold. I lost the argument, since my prepubescent self had never seen a man dressed, well, in a dress. But I became enough of a fan of the band's music to put a Culture Club poster on my bedroom wall, alongside soccer star Pelé and movie star Darth Vader. Culture Club's commercial peak was over by the band's third album, 1984's Waking Up with the House on Fire, and George's drug addiction and tumultuous romantic relationship with Moss led to the band breaking up in 1986. In the years since, the singer has had some solo hits and success as a DJ, and the band regrouped for occasional reunion gigs and recordings. In 2014, the band reformed for the first time in 12 years to write and record new songs for an album that Craig expects to finally see the light of day in 2017. "Once we came back together, it feels like you want to write something new," Craig says. "You want to add to what we've already done." First, though, is the band's 60-plus-date tour that's been through Australia and Japan and is now crisscrossing America. "Playing in America is just the best," Craig says. "The shows have been really, really good. I think we've surprised a lot of people. We obviously play the familiar old 'battle hymns,' as George calls them, and there are some new songs in there." Clearly, nostalgia is the big selling point for the show coming to Airway Heights, with fellow '80s hitmakers Berlin and the English Beat in tow. 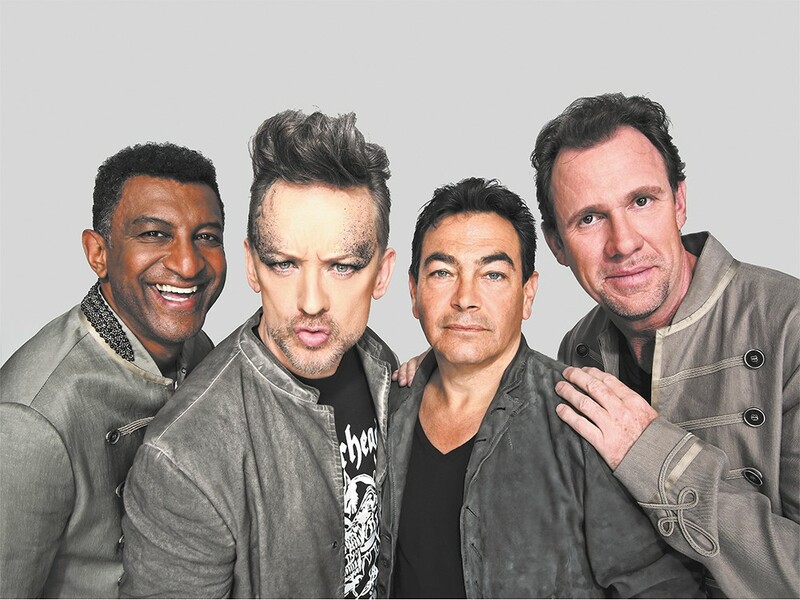 But Craig believes that Culture Club is drawing audiences now, more than 30 years after their initial success, for much the same reason they broke through in the first place. "As well as our music, there's a massive social element to Culture Club," Craig says. "People who grew up with us are people who perhaps were a bit shy about life a little bit. Not all the people, but a lot of people. There are people we helped gain the confidence to step out into the light and be themselves, people who perhaps were a bit frightened of being themselves. Perhaps because they're slightly different.